Another photograph by the late David Samuel Rees, this time from a different angle and affording a clearer view of the station buildings as well as including the level crossing. Again taken in the early post-Grouping period, this time the station appears eerily deserted but the photographer has company in the form of the group of people on the bridge. The LMS open wagon, right of centre, appears to be loaded with newly felled timber. The pitched roof building behind the Down platform is stilted off the ground to protect its contents from rodents. It was probably a store for animal foodstuffs. Adjacent to the level crossing is what looks like a railway goods van with steeply pitched roof. It is in fact a road vehicle and similar to the vehicles once seen towed by steam rollers and used as accommodation for the driver/operator as he moved around from job to job. This example, however, lacks windows and has a sliding door in its bodyside so it was possibly used for local collections and deliveries to and from the railway station - most likely to and from outlying farms. It would have been owned and operated by a local cartage agent rather than by the Great Western Railway. The small building at extreme left and beyond the level crossing was of corrugated iron construction; it no longer exists and a brick structure now stands in its place. Just beyond it, but hidden from view by the trees, was and still is the Penybont Inn, or Pen-y-bont Inn, better known today as 'The Bont'. Its link with train crews is mentioned in another caption and also in the history text. In the foreground runs the Afon Taf and a short distance to the left is its confluence with the Afon Tigen. 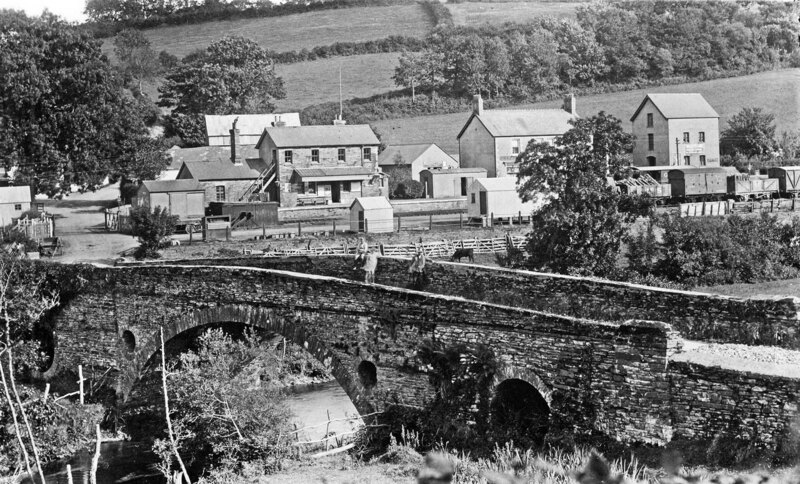 The bridge, carrying the road towards Pant-y-caws, dates from the 1820s and is of brick and slate construction. The cylindrical 'tunnels', one large and one small either side, are for the purpose of weight reduction. The bridge is today a listed structure.